ANYONE CAN CLEAN GUTTERS, RIGHT? Wrong. Gutter cleaning can be dangerous work. And, dangerous work costs a lot to insure. Be certain the person cleaning your gutters has the proper liability and workmen’s compensation policies. You do not want to have someone get hurt on your property without all the proper insurance. Chances are, really low prices come with little to no proper insurance. Furthermore, we have seen the broken shingles, bent & damaged gutters, and clogged downspouts left from our less than professional gutter cleaning competition. Please take the time to consider the following reasons why SparkleWash® of Central Virginia is your best choice for professional gutter cleaning or repair. WHAT MAKES SPARKLEWASH GUTTER CLEANING DIFFERENT? We have liability, auto, garage, and most importantly workmen’s compensation policies. You will receive a certificate of insurance before we begin any gutter cleaning or repair service. Take comfort in knowing you have hired a true professional to clean or repair your gutters. SparkleWash® of Central Virginia is fully licensed. We have a Virginia Class A Contractors License (#2705 126753A) and must answer to the Virginia Board of Contractors. Ask our competition where their “license”, if any, came from. SparkleWash® will never put ladders directly against your gutters or house. We use ladder extensions, so your gutters or siding will never get bent, damaged, or scraped while we perform your gutter cleaning or repair. SparkleWash® of Central Virginia employees have been through a roof safety training course held in Montgomery, Texas. They were rigorously trained and tested before receiving a multi-story roof safety certification. Our employees know the right and safe way to be on your roof, if it is even required. Ask our competitors if they have any formal roof training or certification. SparkleWash® does not sell or install gutters or gutter guard systems. We are not going to try to upsell you on something you may not want or need. We stick to the gutter cleaning and repair, so there is no conflict of interest. If you are thinking about a gutter guard system, please realize (at least in our 30+ years of experience) only the top of line systems perform as one would hope or expect. SparkleWash® of Central Virginia employs specialized gutter cleaning equipment and methods. We are not the guys with just a ladder and a pickup truck looking to make a quick buck. We utilize special rigging equipment, roof apparel, ropes, extension ladders, blowers, vacuums, and poles to get your gutters properly cleaned or repaired. We even have a gutter cleaning robot that we sometimes employ to clean the most difficult to access stretches of gutters. SparkleWash® always bags and disposes of the debris we remove from your gutters. Rest assured, we will leave your property cleaner than when we arrived. SparkleWash® of Central Virginia flushes your gutters and downspouts out with water. We test each downspout to make sure there are no clogs, and that it is draining as it should. Also, the flush out insures your gutters are as clean as possible. 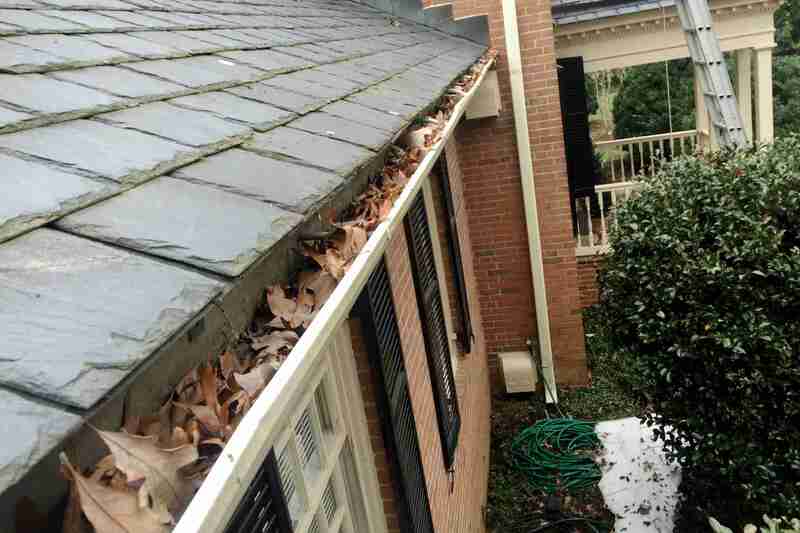 We will even rinse off any debris or overflow that falls on your house or siding during the gutter cleaning process. SparkleWash® can be your one call for every exterior surface cleaning or preservation need. If it’s outside, we can properly clean and protect it. Please visit our Residential Page to learn about all our exterior services. SparkleWash® of Central Virginia gives you a 100% satisfaction guarantee. You will be happy with our work, or you owe us nothing! How much easier or safer can it get? Call us today for a free gutter cleaning or repair estimate.